A RUP LIFE: CHRISTMAS AT ROSE HILL FARM #REVIEW Pluse: iPad Bundle Giveaway & sign up to host a Book Club Brunch! 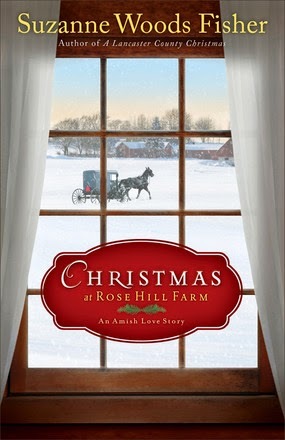 I had the opportunity to review, award-winning author Suzanne Woods Fisher new Amish Christmas book. Filled with heart-twisting moments amid the sweet anticipation of love, Christmas at Rose Hill Farm will charm you into the holiday spirit. This was a delightful book set in Amish country. We follow Bess as she is about to marry her long time friend Amos. It should be the most exciting and happy time of her life but it isn't. See Bess is still in love with her old boyfriend Billy. A little Christmas magic finds a way to bring Bess and Billy together - it is just up to them to work things out. I loved the Hobo character in this book. Reminded me of the movie It's A Wonderful Life. Christmas movies and books can have a little magic and I was okay with it during this book. I felt like even though it was a short read Fisher managed to give us enough back story to make the book flow smoothly. I'd love to read more of from this farm - perhaps a prequel with Bess's Grandmother's story? She sounds like someone that would make a great book to read. I really love Christmas themed books and this one did not disappoint at all! Be sure to pick up your copy at your local book retailer or online at stores like Amazon.